This document explains how to manage power consumption on Red Hat Enterprise Linux 7 systems effectively. The following sections discuss different techniques that lower power consumption (for both server and laptop), and how each technique affects the overall performance of your system. Power management has been one of our focus points for improvements for Red Hat Enterprise Linux 7. Limiting the power used by computer systems is one of the most important aspects of green IT (environmentally friendly computing), a set of considerations that also encompasses the use of recyclable materials, the environmental impact of hardware production, and environmental awareness in the design and deployment of systems. In this document, we provide guidance and information regarding power management of your systems running Red Hat Enterprise Linux 7. By studying the different tasks that your system performs, and configuring each component to ensure that its performance is just sufficient for the job, you can save energy, generate less heat, and optimize battery life for laptops. Many of the principles for analysis and tuning of a system in regard to power consumption are similar to those for performance tuning. To some degree, power management and performance tuning are opposite approaches to system configuration, because systems are usually optimized either towards performance or power. This manual describes the tools that Red Hat provides and the techniques we have developed to help you in this process. Red Hat Enterprise Linux 7 already comes with a lot of new power management features that are enabled by default. They were all selectively chosen to not impact the performance of a typical server or desktop use case. However, for very specific use cases where maximum throughput, lowest latency, or highest CPU performance is absolutely required, a review of those defaults might be necessary. Most of the techniques described in this document impact the performance of your system noticeably. If you choose to implement power management beyond the defaults already in place in Red Hat Enterprise Linux 7, you should monitor the performance of the system after power optimization and decide if the performance loss is acceptable. Auditing and analyzing a system with regard to power consumption is relatively hard, even with the most modern systems available. Most systems do not provide the necessary means to measure power use via software. Exceptions exist though: the ILO management console of Hewlett Packard server systems has a power management module that you can access through the web. IBM provides a similar solution in their BladeCenter power management module. On some Dell systems, the IT Assistant offers power monitoring capabilities as well. Other vendors are likely to offer similar capabilities for their server platforms, but as can be seen there is no single solution available that is supported by all vendors. The introduction of the tickless kernel in Red Hat Enterprise Linux 7 allows the CPU to enter the idle state more frequently, reducing power consumption and improving power management. The PowerTOP tool identifies specific components of kernel and user-space applications that frequently wake up the CPU. PowerTOP was used in development to perform the audits that led to many applications being tuned in this release, reducing unnecessary CPU wake up by a factor of ten. Red Hat Enterprise Linux 7 comes with version 2.x of PowerTOP. This version is a complete rewrite of the 1.x code base. It features a clearer tab-based user interface and extensively uses the kernel "perf" infrastructure to give more accurate data. The power behavior of system devices is tracked and prominently displayed, so problems can be pinpointed quickly. More experimentally, the 2.x codebase includes a power estimation engine that can indicate how much power individual devices and processes are consuming. See Figure 2.1, “PowerTOP in Operation”. Calibration takes time. The process performs various tests, and will cycle through brightness levels and switch devices on and off. Let the process finish and do not interact with the machine during the calibration. When the calibration process is completed, PowerTOP starts as normal. Let it run for approximately an hour to collect data. When enough data is collected, power estimation figures will be displayed in the first column. If you are executing the command on a laptop, it should still be running on battery power so that all available data is presented. While it runs, PowerTOP gathers statistics from the system. In the Overview tab, you can view a list of the components that are either sending wake-ups to the CPU most frequently or are consuming the most power (see Figure 2.1, “PowerTOP in Operation”). The adjacent columns display power estimation, how the resource is being used, wakeups per second, the classification of the component, such as process, device, or timer, and a description of the component. Wakeups per second indicates how efficiently the services or the devices and drivers of the kernel are performing. Less wakeups means less power is consumed. Components are ordered by how much further their power usage can be optimized. If the trace looks like it is repeating itself, then it probably is a busy loop. Fixing such bugs typically requires a code change in that component. As seen in Figure 2.1, “PowerTOP in Operation”, total power consumption and the remaining battery life are displayed, if applicable. Below these is a short summary featuring total wakeups per second, GPU operations per second, and virtual filesystem operations per second. In the rest of the screen there is a list of processes, interrupts, devices and other resources sorted according to their utilization. If properly calibrated, a power consumption estimation for every listed item in the first column is shown as well. Use the Tab and Shift+Tab keys to cycle through tabs. In the Idle stats tab, use of C-states is shown for all processors and cores. In the Frequency stats tab, use of P-states including the Turbo mode (if applicable) is shown for all processors and cores. The longer the CPU stays in the higher C- or P-states, the better (C4 being higher than C3). This is a good indication of how well the CPU usage has been optimized. Residency should ideally be 90% or more in the highest C- or P-state while the system is idle. The Device Stats tab provides similar information to the Overview tab but only for devices. The Tunables tab contains suggestions for optimizing the system for lower power consumption. Use the up and down keys to move through suggestions and the enter key to toggle the suggestion on and off. For more information about PowerTOP, see PowerTOP's home page. PowerTOP can also be used in conjunction with the turbostat utility. It is a reporting tool that displays information about processor topology, frequency, idle power-state statistics, temperature, and power usage on Intel 64 processors. For more information about the turbostat utility, see the turbostat(8) man page, or read the Performance Tuning Guide. Red Hat Enterprise Linux 7 introduces the Battery Life Tool Kit (BLTK), a test suite that simulates and analyzes battery life and performance. BLTK achieves this by performing sets of tasks that simulate specific user groups and reporting on the results. Although developed specifically to test notebook performance, BLTK can also report on the performance of desktop computers when started with the -a.
BLTK supports a large number of more specialized options. For details, see the bltk man page. In Red Hat Enterprise Linux 6 DeviceKit-power assumed the power management functions that were part of HAL and some of the functions that were part of GNOME Power Manager in previous releases of Red Hat Enterprise Linux (refer also to Section 2.7, “GNOME Power Manager”. Red Hat Enterprise Linux 7, DeviceKit-power was renamed to UPower. UPower provides a daemon, an API, and a set of command-line tools. Each power source on the system is represented as a device, whether it is a physical device or not. For example, a laptop battery and an AC power source are both represented as devices. GNOME Power Manager is a daemon that is installed as part of the GNOME desktop environment. Much of the power-management functionality that GNOME Power Manager provided in earlier versions of Red Hat Enterprise Linux has become part of the DeviceKit-power tool in Red Hat Enterprise Linux 6, renamed to UPower in Red Hat Enterprise Linux 7 (see Section 2.6, “UPower”). However, GNOME Power Manager remains a front end for that functionality. Through an applet in the system tray, GNOME Power Manager notifies you of changes in your system's power status; for example, a change from battery to AC power. It also reports battery status, and warns you when battery power is low. To use the cpupower command featured in this chapter, ensure you have the kernel-tools package installed. a state where the clock is frozen for this processor but it keeps the complete state for its registers and caches, so after starting the clock again it can immediately start processing again. This is an optional state. a state where the processor really goes to sleep and does not need to keep its cache up to date. Waking up from this state takes considerably longer than from C2 due to this. Again this is an optional state. Recent Intel CPUs with the "Nehalem" microarchitecture feature a new C-State, C6, which can reduce the voltage supply of a CPU to zero, but typically reduces power consumption by between 80% and 90%. The kernel in Red Hat Enterprise Linux 7 includes optimizations for this new C-State. One of the most effective ways to reduce power consumption and heat output on your system is CPUfreq. CPUfreq — also referred to as CPU speed scaling — is the infrastructure in the Linux kernel that enables to scale the CPU frequency in order to save power. CPU scalling can be done automatically depending on the system load, in response to ACPI events, or manually by user-space programs, and it allows the clock speed of the processor to be adjusted on the fly. This enables the system to run at a reduced clock speed to save power. The rules for shifting frequencies, whether to a faster or slower clock speed, and when to shift frequencies, are defined by the CPUfreq governor. Two drivers for CPUfreq can be used: ACPI CPUfreq driver and Intel P-state driver. ACPI CPUfreq driver is a kernel driver that controls the frequency of a particular CPU through ACPI, which ensures the communication between the kernel and the hardware. In Red Hat Enterprise Linux 7, Intel P-state driver is supported. The driver provides an interface for controlling the P-state selection on processors based on the Intel Xeon E series architecture or newer architectures. Intel P-state implements the setpolicy() callback. The driver decides what P-state to use based on the policy requested from the cpufreq core. If the processor is capable of selecting its next P-state internally, the driver offloads this responsibility to the processor. If not, the driver implements algorithms to select the next P-state. max_perf_pct: Limits the maximum P-state requested by the driver, expressed in a percentage of available performance. The available P-state performance can be reduced by the no_turbo setting (see below). min_perf_pct: min_perf_pct: Limits the minimum P-state requested by the driver, expressed in a percentage of the maximum (no-turbo) performance level. no_turbo: Limits the driver to selecting P-state below the turbo frequency range. turbo_pct: Displays the percentage of the total performance supported by hardware that is in the turbo range. This number is independent of whether turbo has been disabled or not. num_pstates: Displays the number of P-states that are supported by hardware. This number is independent of whether turbo has been disabled or not. The Userspace governor allows user-space programs, or any process running as root, to set the frequency. Of all the governors, Userspace is the most customizable; and depending on how it is configured, it can offer the best balance between performance and consumption for your system. For instructions on how to enable a specific governor, see Section 3.2.3, “CPUfreq Setup”. All CPUfreq drivers are built in as part of the kernel-tools package, and selected automatically, so to set up CPUfreq you just need to select a governor. Once you have chosen an appropriate CPUfreq governor, you can view CPU speed and policy information with the cpupower frequency-info command and further tune the speed of each CPU with options for cpupower frequency-set. --freq — Shows the current speed of the CPU according to the CPUfreq core, in KHz. --hwfreq — Shows the current speed of the CPU according to the hardware, in KHz (only available as root). --driver — Shows what CPUfreq driver is used to set the frequency on this CPU. --governors — Shows the CPUfreq governors available in this kernel. If you wish to use a CPUfreq governor that is not listed in this file, see Section 3.2.3, “CPUfreq Setup” for instructions on how to do so. --affected-cpus — Lists CPUs that require frequency coordination software. --policy — Shows the range of the current CPUfreq policy, in KHz, and the currently active governor. --hwlimits — Lists available frequencies for the CPU, in KHz. --min <freq> and --max <freq> — Set the policy limits of the CPU, in KHz. When setting policy limits, you should set --max before --min. --freq <freq> — Set a specific clock speed for the CPU, in KHz. You can only set a speed within the policy limits of the CPU (as per --min and --max). --governor <gov> — Set a new CPUfreq governor. cpupower features a selection of monitors that provide idle and sleep state statistics and frequency information and report on processor topology. Some monitors are processor-specific, while others are compatible with any processor. Refer to the cpupower-monitor man page for details on what each monitor measures and which systems they are compatible with. -l — list all monitors available on your system. -m <monitor1>, <monitor2> — display specific monitors. 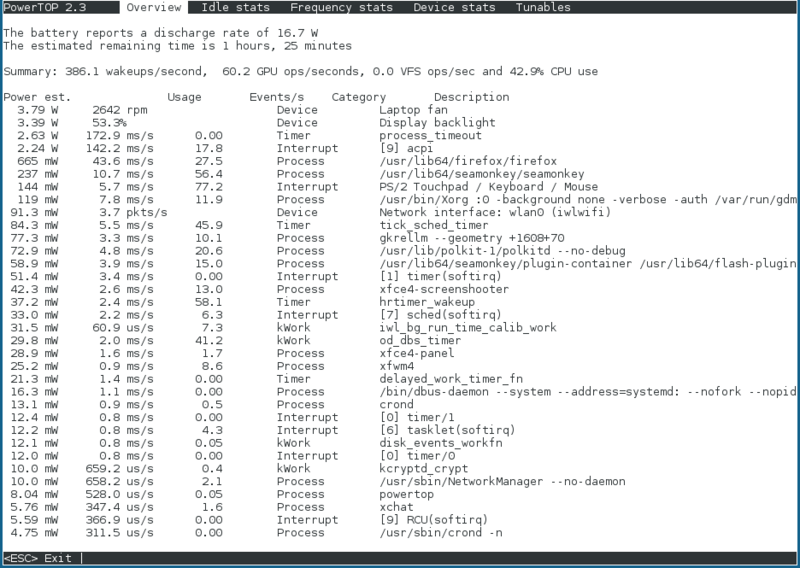 Their identifiers can be found by running -l.
command — display the idle statistics and CPU demands of a specific command. cpupower provides ways to regulate your processor's power saving policies. Allows software on supported Intel processors to more actively contribute to determining the balance between optimum performance and saving power. This does not override other power saving policies. Assigned values range from 0 to 15, where 0 is optimum performance and 15 is optimum power efficiency. By default, this option applies to all cores. To apply it only to individual cores, add the --cpu <cpulist> option. Restricts the use of power by system processes to the cores in one CPU package before other CPU packages are drawn from. 0 sets no restrictions, 1 initially employs only a single CPU package, and 2 does this in addition to favouring semi-idle CPU packages for handling task wakeups. Restricts the use of power by system processes to the thread siblings of one CPU core before drawing on other cores. 0 sets no restrictions, 1 initially employs only a single CPU package, and 2 does this in addition to favouring semi-idle CPU packages for handling task wakeups. Red Hat Enterprise Linux 7 includes greater support for new graphics chipsets, which ensures that suspend and resume will work on a greater number of platforms. In particular, support for NVIDIA chipsets has been greatly improved; in particular for the GeForce 8800 series. Runtime device power management (RDPM) helps to reduce power consumption with minimum user-visible impact. If a device has been idle for a sufficient time and the RDPM hardware support exists in both the device and driver, the device is put into a lower power state. The recovery from the lower power state is assured by an external I/O event for this device, which triggers the kernel and the device driver to bring the device back to the running state. All this occurs automatically, as RDPM is enabled by default. Users are allowed to control RDPM of a device by setting the attribute in a particular RDPM configuration file. The RDPM configuration files for particular devices can be found in the /sys/devices/device/power/ directory, where device replaces the path to the directory of a particular device. This file controls the auto-suspend delay, which is the minimum time period of inactivity between idle state and suspending of the device. The file contains the auto-suspend delay value in milliseconds. A negative value prevents the device from being suspended at run time, thus having the same effect as setting the attribute in the /sys/devices/device/power/control file to on. Values higher than 1000 are rounded up to the nearest second. If you forcibly enable ASPM by using pcie_aspm=force on hardware that does not support ASPM, the system might become unresponsive. Before setting pcie_aspm=force, ensure that all PCIe hardware on the system supports ASPM. For example, pcie_aspm.policy=performance sets the ASPM performance policy. ALPM is only available on SATA controllers that use the Advanced Host Controller Interface (AHCI). For more information about AHCI, see http://www.intel.com/technology/serialata/ahci.htm. The kernel used in Red Hat Enterprise Linux 7 supports another alternative — relatime. Relatime maintains atime data, but not for each time that a file is accessed. With this option enabled, atime data is written to the disk only if the file has been modified since the atime data was last updated (mtime), or if the file was last accessed more than a certain length of time ago (by default, one day). By default, all filesystems are now mounted with relatime enabled. You can suppress it for any particular file system by mounting that file system with the option norelatime. Red Hat Enterprise Linux 7 saves power on graphics and display devices by eliminating several sources of unnecessary consumption. Low-voltage differential signaling (LVDS) is an system for carrying electronic signals over copper wire. One significant application of the system is to transmit pixel information to liquid crystal display (LCD) screens in notebook computers. All displays have a refresh rate — the rate at which they receive fresh data from a graphics controller and redraw the image on the screen. Typically, the screen receives fresh data sixty times per second (a frequency of 60 Hz). When a screen and graphics controller are linked by LVDS, the LVDS system uses power on every refresh cycle. When idle, the refresh rate of many LCD screens can be dropped to 30 Hz without any noticeable effect (unlike cathode ray tube (CRT) monitors, where a decrease in refresh rate produces a characteristic flicker). The driver for Intel graphics adapters built into the kernel used in Red Hat Enterprise Linux 7 performs this downclocking automatically, and saves around 0.5 W when the screen is idle. Synchronous dynamic random access memory (SDRAM) — as used for video memory in graphics adapters — is recharged thousands of times per second so that individual memory cells retain the data that is stored in them. Apart from its main function of managing data as it flows in and out of memory, the memory controller is normally responsible for initiating these refresh cycles. However, SDRAM also has a low-power self-refresh mode. In this mode, the memory uses an internal timer to generate its own refresh cycles, which allows the system to shut down the memory controller without endangering data currently held in memory. The kernel used in Red Hat Enterprise Linux 7 can trigger memory self-refresh in Intel graphics adapters when they are idle, which saves around 0.8 W.
Typical graphical processing units (GPUs) contain internal clocks that govern various parts of their internal circuitry. The kernel used in Red Hat Enterprise Linux 7 can reduce the frequency of some of the internal clocks in Intel and ATI GPUs. Reducing the number of cycles that GPU components perform in a given time saves the power that they would have consumed in the cycles that they did not have to perform. The kernel automatically reduces the speed of these clocks when the GPU is idle, and increases it when GPU activity increases. Reducing GPU clock cycles can save up to 5 W.
The Intel and ATI graphics drivers in Red Hat Enterprise Linux 7 can detect when no monitor is attached to an adapter and therefore shut down the GPU completely. This feature is especially significant for servers which do not have monitors attached to them regularly. For more information on inotify, see the inotify(7) man page. Fsync is known as an I/O expensive operation, but this is is not completely true. However, in other cases, where fsync was not used at all, problems emerged with the switch to the ext4 file system. Ext3 was set to data-ordered mode, which flushed memory every few seconds and saved it to a disk. But with ext4 and laptop_mode, the interval between saves was longer and data might get lost when the system was unexpectedly switched off. Now ext4 is patched, but we must still consider the design of our applications carefully, and use fsync as appropriate. Fixed incorrect package name in Core Infrastructure and Mechanics. Red Hat Enterprise Linux 7.0 release of the book for review purposes.